Back in September, I kicked off my fall R.I.P. 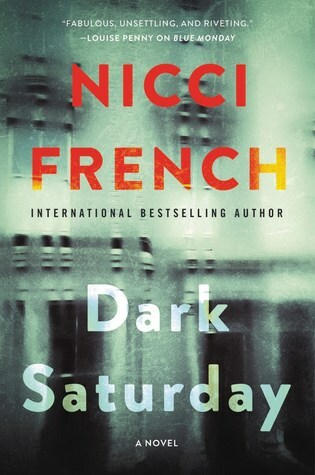 Challenge with a dark and creepy audio book, Dark Saturday by Nicci French, a British thriller that is part of a series starring psychotherapist Frieda Klein. I enjoyed this suspenseful, twisty murder mystery. Frieda Klein has her own psychotherapy practice, but she also consults for the police occasionally. In this case, Frieda is asked by one person on the police force to look into an old case. Ten years ago, 18-year old Hannah Docherty was convicted of killing her mother, step-father, and brother and has spent the last decade in a psychiatric hospital. Her name is well-known among the public as a a psycho killer responsible for one of the region's worst-ever massacres. When Frieda goes to the hospital to interview Hannah, though, she is stunned by what she finds. Hannah is clearly mistreated and abused there. Worse, though she barely talks at all, is that Frieda isn't sure Hannah was actually guilty of the horrible crime that put her there. Frieda gradually digs into the old case, but no one is happy about that; family and friends of the victims have tried to put the horror behind them, and the police aren't pleased about someone throwing doubt on a settled case from so long ago. The deeper she digs, though, the more Frieda believes there is more to this case than first thought...and the more she realizes that she - and everyone else she involves - is in danger. This is a fast-paced twisty thriller with lots of unexpected surprises and suspense, so I enjoyed it. However, this is book 6 in a series, and there were frequent references to past experiences and Frieda's earlier cases, one of which is still causing problems in the present. There was some explanation of what had happened in earlier novels, where relevant, but I still felt like I had missed something. The audio book with Beth Chalmers as narrator was well-done and easy to follow (sometimes a problem with complex plots on audio). Dark Saturday kept me guessing with plenty of dead ends and red herrings, and I would definitely read another of Nicci French's novels. Listen to a sample of the audio of Dark Saturday. Or order Dark Saturday from Book Depository, with free shipping worldwide. This sounds good but I'd want to start with book 1 and that seems a bit daunting. Well, the author did a decent job of explaining things when necessary, but there is definitely a throughline plot underneath the main plot. I did like the main character & this story. It's frustrating to come in at book 6! It wasn't too bad - I could just tell I had missed some of the ongoing stuff.